Visual Art Diary 11x14 Poly 60L 110gsm Acid free, 110gsm cartridge, black poly cover and board back. Visual Art Diary A3 Poly 60 L Acid free 110gsm cartridge, black poly Cover and heavy board back- Spiral bound. Visual Art Diary A4 Poly 60 Leaf or 120 page - Acid free 110gsm cartridge, black polypropylene cover and heavy board back- Single wire spiral bound. Visual Art Diary A5 Poly 60L Acid free 110gsm cartridge, black poly cover and heavy board back- Spiral bound. Visual Art Diary A5 with Insertable Cover - 60leaf (120page) Premium 120gsm cartridge paper - Double wire bound - Heavy cardboard back cover - Black polypropylene front cover with full clear insert pocket. Personalise your visual art diary with your own design insert page or insert a school logo. NEW and top quality. Visual Art Diary A4 with Insertable cover - 60 leaf (120 page) Premium 120gsm cartridge paper - Double wire bound - Heavy cardboard back cover - Black polypropylene cover with full clear insert pocket. 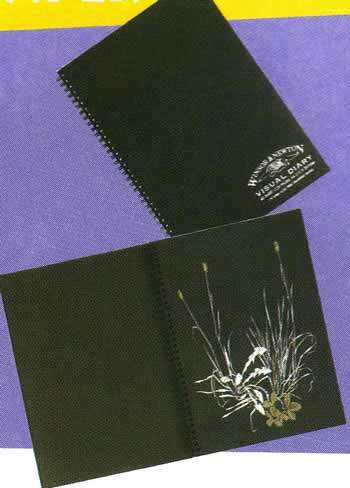 Personalise your visual art diary with your own design insert page or insert your school logo. NEW and top quality. Visual Art Diary A4 Black Paper 45 sheet, 100gsm black paper- Black poly cover and heavy board back- Double wire bound - suits Photography presentation. 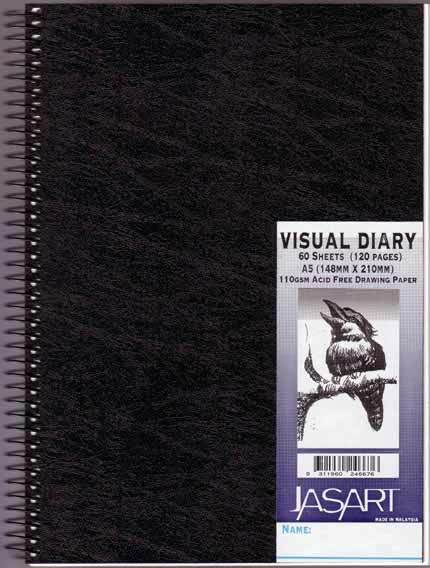 Visual Art Diary A4 Hard Covered - 60 sheets 110gsm Cartridge- Black hard cover and back- spiral bound - Excellent value and quality. Visual Art Diary Black Paper 360x280mm 40 sheet, 140gsm black paper- Black poly cover and heavy board back- Double wire bound-SUPER SPECIAL! WHILE STOCKS LAST! Visual Art Diary A4 Sketch & Write- Alternate 110 gsm cartridge and ruled page - 60leaf.